Most of our clients are investment-minded, and we love the notion of keeping your current home as a rental when you move out of the area or buy a bigger home. But, how do you know if you’re making the right decision and if you’re ready to be a landlord? 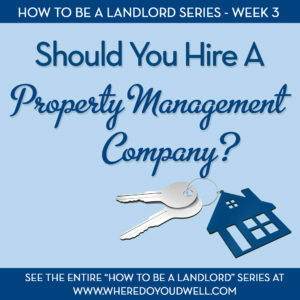 This week’s installment is part three of our four-part series, and you’ll learn what you should consider before hiring a property management company to oversee your rental. Is it the best decision for you? Once you’ve decided to rent out your home, you need to think about whether you’re going to do it alone or hire a property management company. There are several benefits to having a company handle many of the landlord duties for your rental. You could have the management company handle everything, including the marketing and screening of tenants. Or, you can save money and find a suitable tenant yourself via Craigslist and then work with the company to write the lease and handle the property management from that point on. Your should first determine if the cost of a property management company is worth the expense. You’ll have to cut into your profit margin when hiring a company, so expect to pay a fee between 10-12% of the monthly rent. You also may need to pay a leasing fee of one month’s rent for finding and screening tenants. So when taking all these fees into account, your annual cost could add up to two month’s rent for the year. Is that doable when considering the possible income you’ll get from your rental property? It’s important to do the math! What’s the Best Choice for You? Even if you’re not happy about the expense of hiring a property management company, you should still carefully look at your particular situation and these important factors. Sometimes the expense will be worth it. You don’t live near your rental property or you travel frequently. Handling tenants and any issues that may arise can be difficult if you aren’t around. You want to be able to make regular visits, keep a close eye on your property, and be available for any last-minute emergencies. A property management company would alleviate all of these responsibilities. You don’t want to deal with tenants or the stress of being a landlord. You may like the additional income a rental can generate, but hands-on management or tenant interactions aren’t your thing. If your tolerance is low, a company can handle a wide range of situations – late payments, emergency phone calls, enforcement of lease requirements (such as no pets or smoking), inspection of property and dealing with any damage, etc. A company can bring a level of professionalism that tenants may better respond to and you don’t have to be the bad guy. You don’t have the time or the proper skills to screen potential tenants and try to fill vacancies. You want good tenants that will stay for a while and a company can handle the marketing and screening to find such tenants (this option typically costs one month’s rent). They can post ads on Craigslist and put it on the MLS system. Remember, it’s time consuming to field calls from interested tenants, conduct screen checks, show your property, etc. Plus, management companies have seen tons of applications and have more experience pinpointing any “warning signs” of bad tenants or preventing any possible discrimination lawsuits. You’re not a DIY handyman and don’t want to handle maintenance and repairs. The upkeep of your property is key to keeping your tenants happy and to finding new tenants easily when it’s vacant. Things will break unexpectedly and most tenants will cause some wear and tear of your home. A management company can find reliable services from their network of local contacts to work on your home. They also can recommend improvements to your rental that can maximize your profit. You aren’t able to keep up with tenant laws and aren’t sure how to move forward with an eviction. It’s important to protect yourself from lawsuits or any liability as a landlord. A property management company can ensure that your rental is up to code in terms of safety and health and stays up-to-date on discrimination laws and other state, federal or local legislation. Perhaps you’re not comfortable confronting tenants when facing an eviction or other legal issues. That’s where you can turn to a company, which will know the proper way to deal with tenants when filing for an eviction or handling any litigation. You don’t mind “handing over the reins” when it comes to your home. By hiring a management company, you are relinquishing some of your control. Can you deal with that? To set your mind at ease, it’s important to hire a reputable company that you can trust. Get recommendations from colleagues, friends, family members, real estate agents, or your condo association. Do your research and interview other landlords. We are excited to bring you our four part How to Be a Landlord Series. Next week’s article, What to Know If You’re a DC Landlord, is a bonus. It gives a rundown of specific guidelines and requirements when you’re a landlord. Stay tuned!